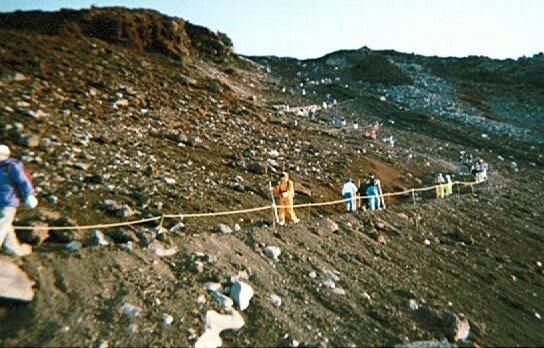 This trail up Mount Fuji is steeper than it looks! One year ago was my first attempt to climb Mount Fuji, Japan's highest mountain. A dormant volcano that reaches almost 13,000 feet above sea level, Fuji is the most frequently climbed mountain in the world. Climbers begin at the Fifth station (8000 feet) and follow a steep rocky trail with numerous switchbacks to the Tenth station at the summit. Last year I reached the Ninth station (11,000 feet). Zero visibility and cold rain and wind took away my motivation to continue climbing. This summer I was undecided about trying again, until I heard the chapel youth group needed chaperones for an overnight trip. Spending the night on the mountain would be more interesting than last year's up-and-down journey. Three vans containing thirty people left Atsugi on a warm sunny August morning and drove to Mount Fuji. Carrying my 57-inch Fuji climbing stick, I led the first group out of the Fifth station at 1:40 PM. Ten minutes later we met an American who told us, "Good luck. You'll need it." At the Seventh station, the other chaperone in the first group took the slower climbers and I went on ahead with five thirteen-year-olds. The stations were the only buildings and only signs of life on the mountain. The lower ones merely sold snacks and stamped brands on the climbing sticks. The higher ones provided overnight lodging and hot food. Due to a limited water supply, none had flush toilets. Our sense of smell always told us where the toilets were. By the time we reached the Eighth station, I was looking for the "hotel" where we had reservations to spend the night. I saw no possibilities, and no one could show me on the maps I carried just where we were. I decided to go up to the Ninth station and wait until other Atsugi climbers arrived. While we were resting there after our four-hour climb, a man tapped my shoulder and motioned that I had a telephone call. Our trip organizer, who spoke fluent Japanese, was calling from the Seventh station. We had climbed the wrong side of the mountain; our hotel was on the opposite side. She said the rest of the Atsugi crowd had reached the Seventh station and was spending the night there. She would ask the proprietor at the Ninth station to put up my group. The proprietor took us through his main room to the sleeping area, which consisted of eight curtained wood cubicles on either side of an aisle. He gave us our choice of a ground-floor cubicle or a loft. It's easy to guess which one the 13-year-olds chose. We climbed a ladder to get to and from our space. The unisex bathroom was a narrow room with a six-foot gutter for a urinal and a row of stalls past that. Fortunately, the stalls had doors and toilet paper and some even had western-style stools instead of slits in the floor. The only sink was directly across from the urinal. I decided to skip brushing my teeth that night. We sat around the electric heater in the main room with the other climbers. The kids made a project of shaking hands with people from as many nations as possible. During the night they found ten nationalities, from Kenya to Brazil to Holland. Our sleeping compartment contained two thin futons (mattresses), plus four small thick blankets and numerous pillows that could have doubled as sandbags. I settled against the back wall, keeping my legs bent because there was no room to stretch out completely. Not expecting to get much sleep in that slumber party atmosphere, I wasn't mistaken. My companions carried on a boisterous discussion in spite of frequent reminders from me and other guests to be quiet. Then they got bored and decided to go outside and wait for the rest of our group. When I checked on them after midnight, they were visiting with climbers resting outside in the 42-degree night. The main room was dark, with people sleeping and the heater turned off. Noise woke me at 2:30, and I was surprised to see the main room packed with climbers. The heater was on and breakfast being served. An Atsugi chaperone arrived at 3:30 and paid our hotel bill. Before 4:00 I led my five back onto the trail, with Fuji sticks in one hand and flashlights in the other. Climbing in the dark was easier than I expected, and the dawn soon allowed us to see the ground. So many people were climbing this last hour-long stretch that we sometimes had to wait, but no one possessed sufficient oxygen to move fast anyhow. We reached the summit just prior to sunrise. A joyous sense of accomplishment flooded me as I stood at the rim of the volcano's crater. Half a mile wide and 600 feet deep, it was ringed by a two-mile trail, which I did not have the energy to explore. A man at the Tenth station's Buddhist temple added the last two stamps to my Fuji stick, completing the collection from last year. At 5:45 we started back down the mountain. Sliding through the loose lava rock was almost harder than climbing. We kept our eyes on the trail and concentrated on our footing. The two girls, impatient with the slower pace of the three boys, went on ahead. It took us five hours to get back to the Fifth station, the same amount of time it had taken to climb to the top. The weather was perfect throughout. Although chilly at the top, there was only a slight breeze and the sun occasionally peeked through the clouds. During the descent, clouds protected us from the suns rays. My photographs failed to capture the vertical distances and the trail's steepness. But still, I have photos and memories. I climbed Mount Fuji, and I never have to do it again.